Carex vulpinoidea is a perennial C3 sedge (Basinger 2002), stems tufted, yellow-green, 30 cm to 1 m, stems sharply 3-sided, rough above. Leaves 3-ranked, blade flat, 0.2-0.5 cm wide, to 1.2 m long, often taller than stems (Flora of North America Editorial Committee 1993+), those at very base of stem bladeless, upper (inner) side of sheath membranous, often puckered cross-wise. 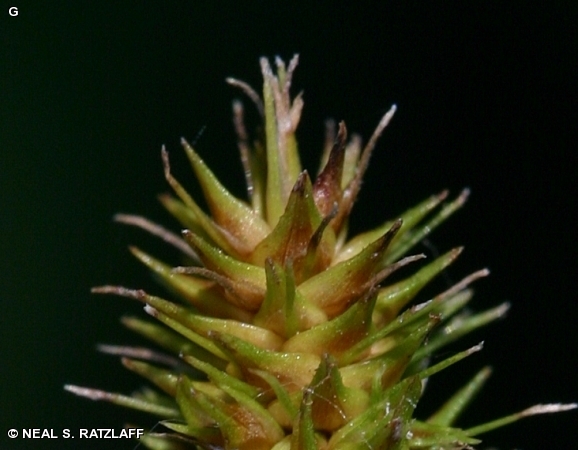 Carex vulpinoidea inflorescences. NRCS-2. commons.wikimedia.org (Accessed 12/2017). Flower spikes all alike, with a few male (staminate) flowers at top of most spikes (androgynous), perigynia (sac enclosing each female flower), flat, greenish to straw-colored, body of perigynium to 0.3 cm long, 0.2 cm wide, narrowly to broadly egg-shaped, tip gradually tapered to beak 1/2 to 2/3 as long as body, veins inconspicuous, margin finely toothed, scale below each female flower narrow, awned to 0.5 cm, nearly as long as beak of perigynium, achene (fruit) lens-shaped, 2 stigmas; inflorescence crowded near top of stem, dense, 5-10 cm long, to 1.5 cm wide, irregularly cylindrical, stiff, clusters of small spikes crowded, stalkless (sessile), lower spikes usually with more than one spike per node (compound), upper spikes very crowded hardly distinguishable, bract at each node (below each spike) hair-like, sticking out of inflorescence, giving it a hairy-fuzzy appearance; lowest bract to 5 cm, often longer than inflorescence; blooms and fruits June-July. 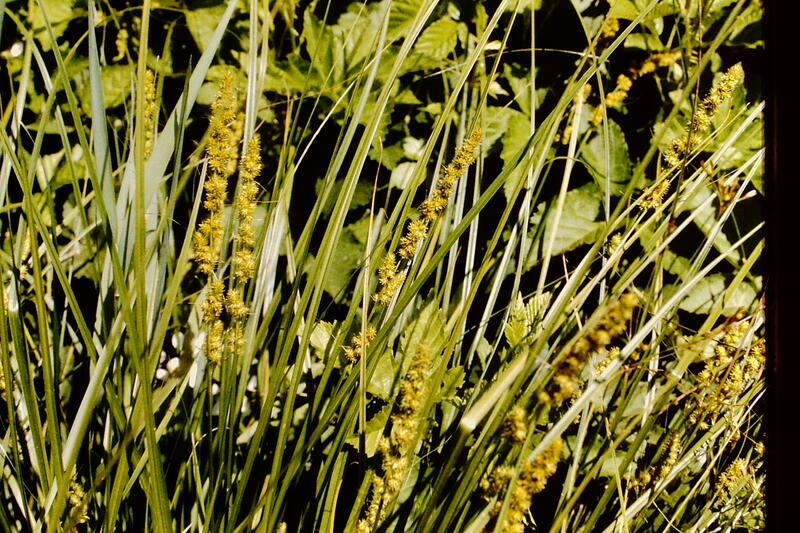 Carex vulpinoidea perigynia. © Neal S. Ratzlaff. Nature Search. Fontenelle Forest. fnanaturesearch.org (Accessed 12/2017). Habitat: Open wet areas, meadows, pond edges, ditches, soil pH 6.8-8.9, moderately tolerant of shade and anaerobic soil, intolerant of fire, salt and drought (USDA, NRCS 2010).